Kolomyja (Pol. : Kołomyja, Germ. : Kolomea) is a city in the Southwest Ukraine where Jews had lived since the 16th Century. Between 1772 and 1918 this area was a region within the Habsburg Empire, thereafter becoming a part of Poland until the outbreak of WW2. Approximately 15,000 Jews lived in Kolomyja when on 17 September 1939, Soviet troops entered the city, and the region within which it was situated was incorporated into the Soviet Union, although the Jewish population would eventually rise to more than 60,000 during the course of 1939-1941. The Soviets retained control of the city until the outbreak of hostilities with Germany in June 1941. On 3 July 1941, the Soviets withdrew from Kolomyja, and the following day Hungarian troops, allied to Germany, occupied the city. From this time onward Jewish property was confiscated and restrictions were imposed. Jews had to wear the Star of David, and many were taken for forced labour. These conditions deteriorated still further after the city came under German control on 1 August 1941. The new Kreishauptmann (Chief of District) was Klaus Volkmann, with Michael as head of the Labour Office, and Oberleutnant Herbert Härtel (Hertel, Hertl) as Chief of a detachment of the Schupo (City Police). 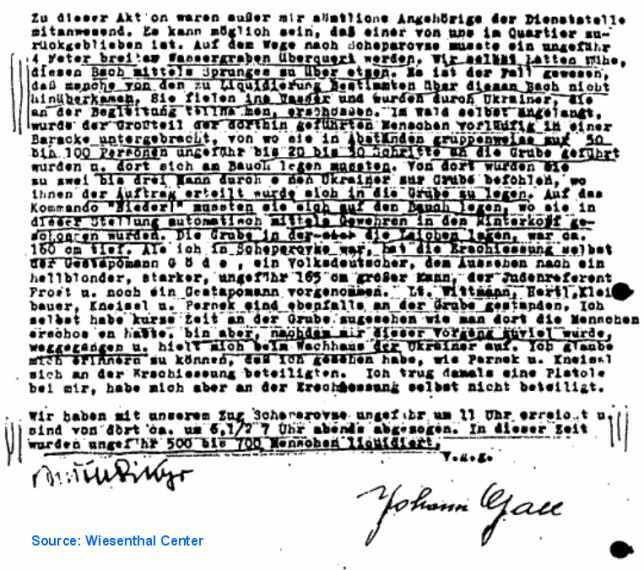 In August 1941, Volkmann ordered the Jews to hand over all of their gold, silver, jewellery, furs and woollens. Refusal to obey this order would result in immediate death. It was accepted that much of this property was pilfered by the occupiers. By a special decree that same month, the Kreishauptmannschaft set up its own auxiliary police force called Sonderdienst, which was comprised of local Volksdeutsche. 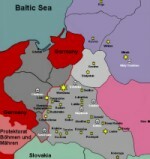 To carry out the planned "resettlement" actions to Belzec, and the mass killings at Szeparowce Forest, the Jewish cemetery, the town slaughterhouse, and the town prison, units of SS, police, Gestapo, Ukrainian police auxiliaries and local Ukrainian auxiliaries were ordered to Kolomyja. On 21 September 1941, the staff of the SD and Sipo, commanded by SS-Obersturmführer Peter Leideritz rounded up 250 Jews. Three days later they were taken to neighbouring Korolowka to be shot, but these executions were prevented by the Hungarians. In August 1941 a Judenrat was established, led by Mordechai (Markus, Motye) Horowitz. A centralised Judenrat operated in most districts, with Kolomyja including the towns of Kuty, Kosow, etc. This resulted in much argument between the various local and district Jewish representatives. The Judenrat organised the supply of Jewish labourers for the town administration. The Jews officially received wages amounting to 80% of the scale fixed for the 'Aryan' population. In reality, the Jews received much less. The wages were paid directly to the Judenrat which distributed a small amount to the actual worker, after taxes and other expenses. Survivors held very different opinions about the activities of the Judenrat generally and of Horowitz in particular. Some accused Horowitz of collaborating with the Germans; others believed that he was a victim of circumstances. Before the war Horowitz was a very well known and respected industrialist in Kolomyja, but he refused to be elected to the public institutions of the community and the city. During the war he was appointed to his position by the Gestapo, but before this occurred the Germans had wounded him, arrested him, and sentenced him to death. These facts weakened his will. Becoming the chairman of the Judenrat changed his life. Although before the war he was not a religious person, he organised minyans (the quorum of ten males necessary to conduct a religious service) in the office of the Judenrat, knowing very well that it was illegal. He paid attention to the poor. His resolve was probably also weakened by the fact that in September 1941 he had lost his wife. He had refused to release her from a group of arrested people, explaining that he could not treat her preferentially when other people were being taken to their death. 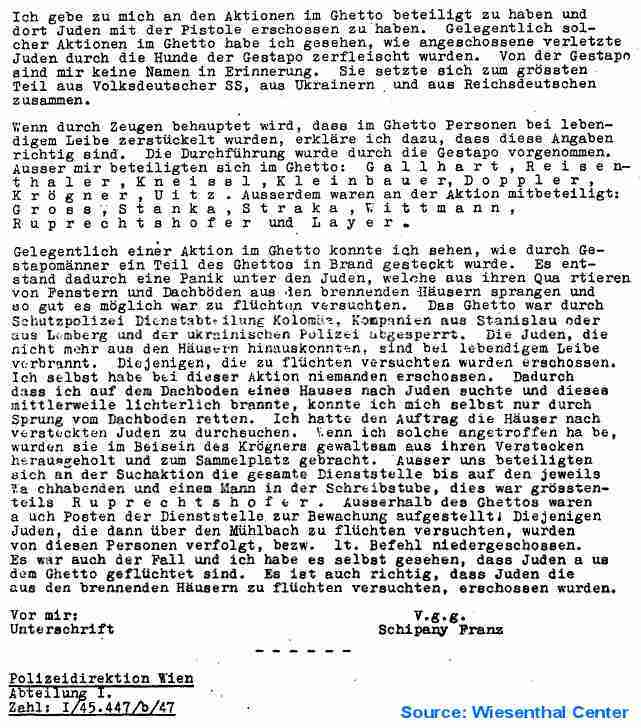 Concerning other members of the Judenrat such as Dr Moshe Hutchnecker, Lazar Biber, Isser Reichman or those who collaborated closely with the Gestapo (Joel Jakobi, Itzele Ganeva – it is not possible to state today if these individuals were really members of the Judenrat), survivors' opinions are much more damning than those expressed in respect of Horowitz. Kosow, Jablonow, Pistyn, Peczenizyn, Horodenka, Czernelica, Gwozdziec, Zablotow and Zabie. with a bullet in the neck." 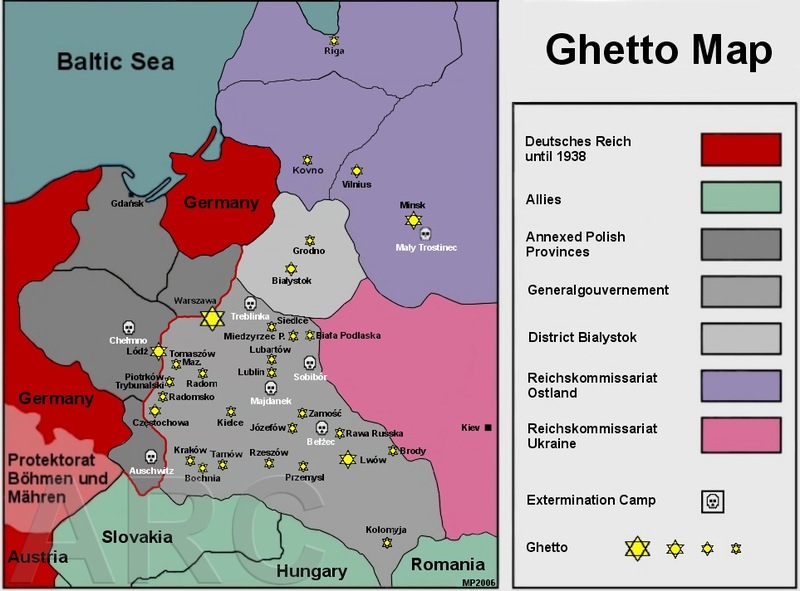 "In the Autumn of 1941, the Jews were surrounded in the ghetto and driven to the prison. From there they were marched to the Szeparowce Forest, where they were liquidated by the SD. The Jews had to go naked into a sand pit, lie on their stomachs and were shot in the head by myself. I carried out other liquidations in the Jewish cemetery and the prison and also outside Kolomyja, in Zablotow, Sniatyn, Ottynia, and Horodenka." "Chlipko from the Hilfspolizei, a Ukrainian who was from Bukovina, said that he wanted to demonstrate a mass execution of Jews without using bullets... He explained how he wanted to spare the Judenrat the cost this institution would have to bear for used munitions. The grave was in the form of a quadrangle. Chlipko ordered the victims to lie around the grave so that their bodies were on the earth with their heads over the graves. Next he took a big axe, and like a crazy man he jumped over the prostrate bodies and with every stroke of the axe one head fell into the grave. After this he became very tired and was completely splashed with blood." The SS men put a stop to this kind of execution and the rest of the Jews were executed "in the traditional way". On 23 December, all Jews who possessed a foreign passport were ordered to the Kolomyja Gestapo. The 1,200 who followed this order were also taken to Szeparowce Forest and killed. On 24 January 1942, 400 Jewish intellectuals were imprisoned, tortured, and killed. 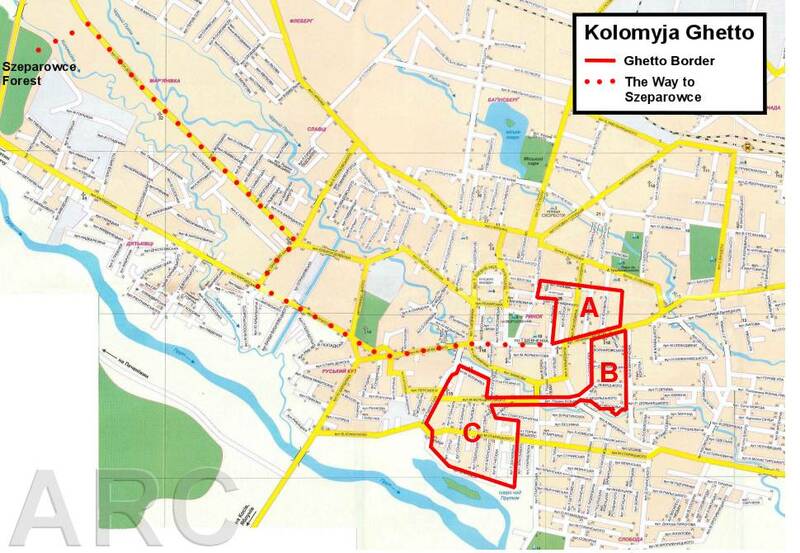 On 23 March 1942 a ghetto was established in three sections – A,B, and C. 16,000-18,000 Jews were forced to move into 520 ghetto houses, among them the thousands of refugees from occupied Poland who had arrived in Kolomyja since September 1939, and Jews deported (Volkmann: “evacuated”) from surrounding villages. The living conditions were as appalling as in many other ghettos. The Jews suffered from famine and epidemics. 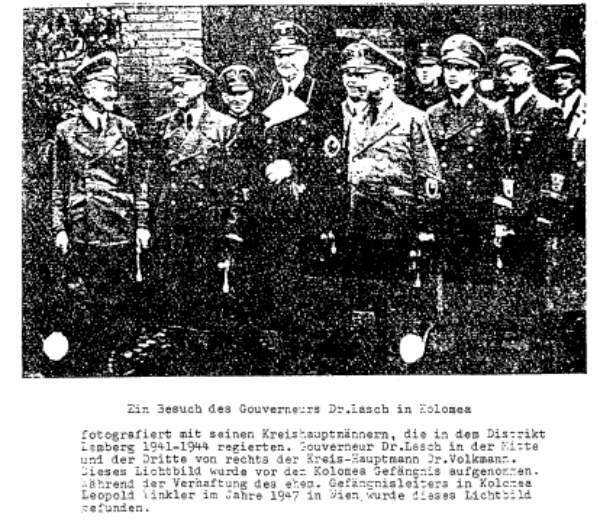 Nevertheless the Judenrat attempted to relieve the misery, even organizing cultural and educational events. On 3-6 April 1942, Ghetto C (where those unfit for work were crammed together) was surrounded and destroyed by Sipo and Schupo. The houses were set on fire and the inhabitants driven out. Hundreds of Jews were shot or died by jumping out of windows. Together with hundreds of expelled Jews from Ghetto B, a total of 3,000 Jews were deported to Belzec. "Supplies of food were finished and hunger began to stalk the ghetto. Potato-peelings, slaughtered cats and dogs were the most luxurious food. Soup was cooked from nettles. Because of the effects of starvation, sickness spread in the ghetto. The people swelled from hunger and they died in the streets. Every day about 50 bodies were gathered from the streets." Because of the desperate lack of food, the author of these memoirs decided to escape from Kolomyja to Krakow. It was the first step toward survival. On 29 August 1942 Friedrich Katzmann (Generalmajor der Polizei und RKF Galizien) ordered the clearing of the Kolomyja District. On 7 September 1942, around 5,300 Jews were ordered to assemble at Aleja Wolnosci, from where they were brought to the station. 4,769 Jews were transported in 48 wagons to Belzec. During this action around 530 Jews were shot in the city. From 8-10 September, 5,500 Jews were driven out of the surrounding towns and villages. Hundreds had to walk - for example, 50 km from Kuty and 35 km from Kosow - to Kolomyja. At Kolomyja station only 30 wagons were waiting for them, and so the police forced 180-200 people into each wagon. At the same time another freight train was waiting at the station: 20 wagons, containing 4,000 Jews from Horodenka and Sniatyn. Both trains were combined to form a very long and overloaded 50 freight-wagon transport. Because of the summer heat, all of the Jews in the wagons had meanwhile undressed, suffering from thirst and lack of air. At 20:50 the train started to Belzec, at nearly a snail’s pace. Those who jumped off the train through the small windows from which the victims had removed the barbed wire were shot by the accompanying police commando. In Stanislawow the train had to stop because the barbed wire had to be reinstalled. This happened at each of the next stations. After 14 hours the train arrived at 11:00 in Lwow. There the Jews destined for work at the ZAL Janowska were replaced by Janowska Jews who were no longer fit for work. Then the train started toward its final destination, even slower than before. Shortly after leaving Lwow the police command had already expended its ammunition. Therefore the killers threw stones at the escapees, and used their bayonets. At 18:45 the death train arrived in Belzec. When it was unloaded it was discovered that 200 Jews had perished in the wagons. 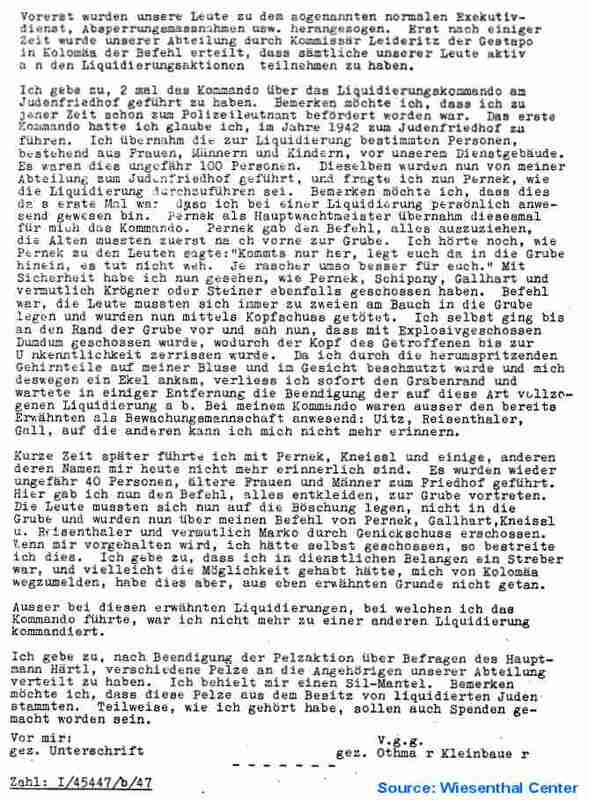 (See the Westermann Report for a complete account). It should be noted that Westermann might have prepared two reports, which are not identical. It is possible that either because of this or due to a typing error the number of fatalities of Jews in transit is quoted by some sources as 200 and by others as 2,000. Given the size of the transport, and in comparison with other transports, it seems probable that the higher figure is the more accurate. "The screaming and yelling did not cease until late afternoon, when the train finally moved. To where? There was no doubt – ultimately to death.I was in one of those wagons, along with my parents. We were still together. My parents probably thanked God that I often lost consciousness, because what was taking place inside the wagon exceeded the most vivid conception of purgatory. How long did it last? Hours? Eternity? Whenever I recovered consciousness I was still there – in hell. In a wagon that could hardly contain 50 or 60 people, some 200 had been packed. (...) Cries, stench, and the acrid odour of chlorine. (...) Through the screams and the drumming of the wheels we could hear shooting. In a moment of awareness, I realized that we were standing naked, pressed to the side of the wagon. With their intertwined arms, my parents had created a kind of shelter. It was thanks to this that I was still alive. I noticed that everybody was naked, although I remembered that we had all entered the wagon fully clothed. It was so hot that people had somehow managed to undress themselves in the midst of the crowd. Those standing in the middle were probably already dead, but were unable to fall down." From 11-13 October 1942 4,000 Jews were deported to Belzec, among them the children of the Kolomyja orphanage. The ghetto was now reduced in size. "After the number of Jews was reduced in this way, the authorities decided that the first Jewish quarter would be enough for those who were left. And this is how it happened. Some carried only as much as they could with their hands to their new "dwellings." Whole families were already rare: parents had lost their children and children had lost their parents. Nevertheless it was impossible to drive everyone into one corner. There were still too many Jews to crowd into the few small streets. And those who still owned something paid large sums to get housing. The destitute ones were thrown out into the streets. Despite the harsh cold, people had to live in destroyed synagogues, in cellars and in attics. Typical of those times were the homeless children. Without parents, without a home, they lived on the streets. With a little dish and a little spoon in their hands, they went from house to house and constantly one heard their little cries: "Lady, lady, only one little spoon of food", "Housewife, only a little bit of bread", "Lady, only some hot cooked soup!" Only seldom was there found a warm-hearted person for almost every woman was just as hungry as the begging child. They wandered about forlornly until they perished, swollen from hunger." Because of the hopeless situation, together with his sister Miriam, Mordechai Horowitz committed suicide in his office at the Judenrat in late October 1942. There is an account that in his final letter he wrote that he had lost all hope of saving the last Jews of Kolomyja. The same account suggests that when Gestapo man Frost heard of the death of the chairman of the Judenrat, he said cynically: "He was a proper Jew. He saved us work and a bullet." In the final Aktion on 4 November, a further 1,000 Jews were killed at Szeparowce Forest. 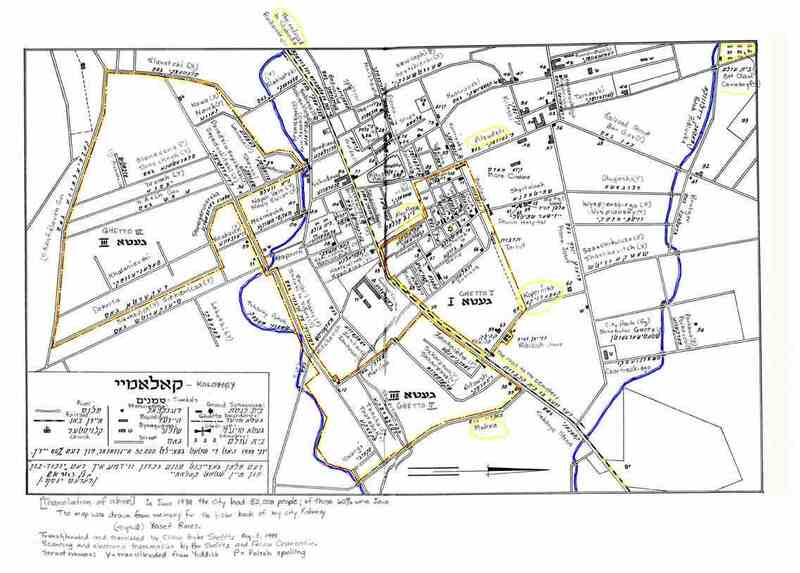 On 20 January 1943 the remaining 2,000 Jews were concentrated in a few ghetto houses, where they were incarcerated until the ghetto was liquidated on 2 February 1943. The last inhabitants were murdered at Szeparowce Forest. The beautiful centre in Kolomyja, where once thousands of Jews traded, the Rynek, the so called "Canal", the Hai Platz (Plac Sienny ?- Kopernik Street ? ), Pilsudski Street with its many stores: all are empty. The gentiles that I formerly knew are almost all here. Market day looked as it did before (only without Jews). Many good things were for sale. On display for sale were old furniture, bedding, clothing, underwear, entire Jewish households - even candlesticks and prayer shawls. And everyone bought. Jews had no choice. They spent their first and last earned Groshn. They were in effect, naked and barefoot. They were afraid for their lives. A Jew couldn't go to a village. Their lives were in danger. Once we were shot at in the middle of the city. Luckily, the bullet missed my husband's ear." "In the name of thousands of men, women, and children who were killed in the Szeparowce Forest and in the Jewish cemetery in Kolomyja; in the name of the last ghetto orphans who were left without a roof over their heads and died of hunger or were shot in the streets of the ghetto; in the name of the elders and little children who died of hunger, thirst and exhaustion in the trains on the way to the Belzec concentration camp; in the name of thousands who were dragged naked from their beds and driven to their deaths; in the name of all who were shot trying to escape, WE ACCUSE THE MURDERERS!" girl in the street, the daughter of a doctor from Kolomyja. Before the gathered members of the Judenrat he began to extol her beauty. Later he took her in his arms and shot her with his revolver, explaining that he did not want her to suffer later." Former members of the Kolomyja Schupo, arrested in Austria in 1947, were extradited to the Soviet Union at the end of 1948, and released in a general amnesty in 1955 to return to Austria. Of the 14 surviving men who had been arrested in 1947, only 6 were then tried for their crimes by Austrian courts. In post-war trials in West Germany, Goede was sentenced to life imprisonment plus 6 years, while others received modest sentences or were acquitted. After the war Volkmann worked under the pseudonym Peter Grubbe as a correspondent for West-German newspapers. His preliminary proceedings by StA "Darmstadt were dismissed. (Polizei Sipo Kolomea) Crimes committed in Szeparowce, Kolomea, Horodenka, Kossow, Kuty in 1941-43: Mass and single killings as well as deportations to KL Belzec. (Polizei Sipo Kolomea) Crimes committed in Oct. 1941 in Kolomea and Kossow: Mass killings of the Jews in Szeparowce forest near Kolomea as well as in neighbouring Kossow. Jewish Historical Institute in Warsaw, Testimonies and Memoirs by Survivors.